I may have mentioned this one or two times before but cupcakes are sort of my thing. The Doughgasm girl icon has a cupcake in her hand for a reason. When a Cupcake Tour of Hollywood showed up in my Group offerings,I was pulling out my wallet in record time. The cupcake tour Groupon cost $47 for a tour for two. Which, is down from the Great Food Tour’s normal price of $100. That is a bit steep but Chris has been known to enjoy the taste of a cupcake now and then too and I figured it would be a nice foodie day out. The morning of the Cupcake Tour of Hollywood started with a bit of chaos when we misinterpreted the address the company gave for the starting point of the tour. I have a bit of a thing about being on time and had a mini stress attack before we finally figured out where we should be and powered our way there just in time for the tour to begin. When we finally arrived at the first cupcake store of the day, Georgetown Cupcake, we were met by a tour guide that suggested we go inside and buy a bottle of water for the journey. I suppose we should have thought about bringing a drink with us but since we didn’t we took his advice. Once the rest of the tour group had gathered, the tour guide told us that we would each be getting to try a mini cupcake from the shop. 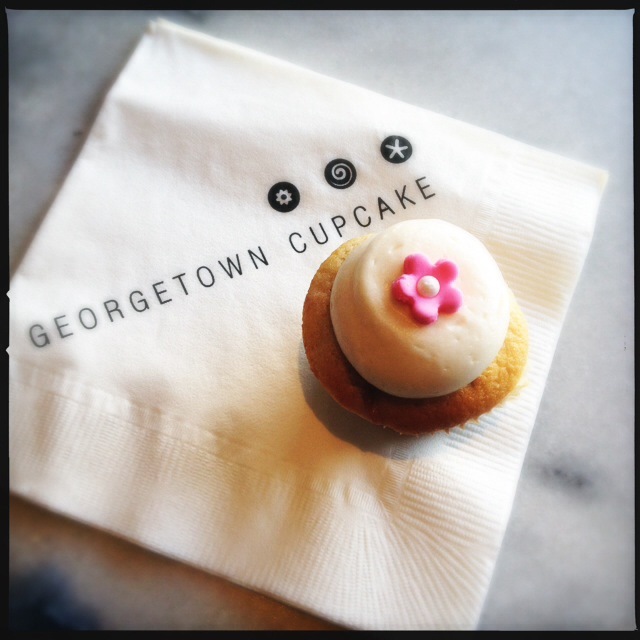 The offering of the day was the Cherry Blossom cupcake that Georgetown Cupcakes created as a homage to their Washington DC origins. The Cherry Blossom cupcake is a Madagascar bourbon vanilla cake with fresh cherries baked into the cupcake. It is then topped with a cherry infused cream cheese frosting with a fondant cherry blossom appropriately being the cherry on top. Neither myself or Chris usually care for cream cheese frosting. So, I was a bit unsure about how the cupcake would go down with us but, as it turned out, the cupcake was really good. The cherries in the batter had a lovely fresh taste and helped to keep the cake extra moist. 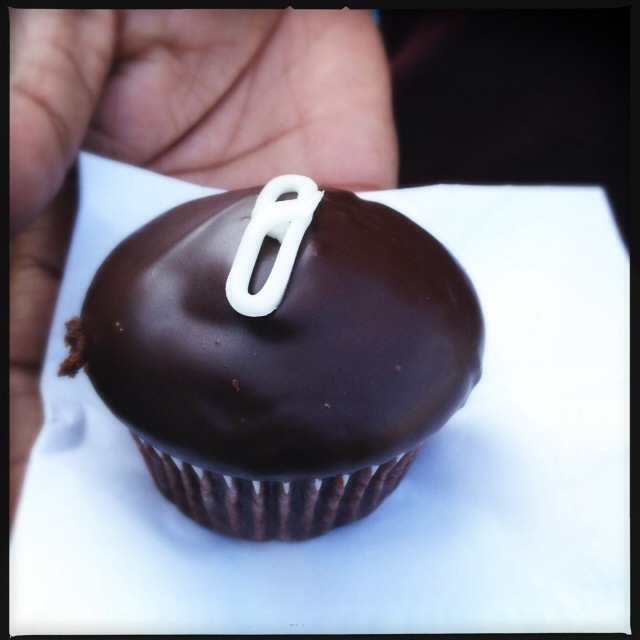 A big thumbs up from both of us and left us curious to try more from the Georgetown Cupcake menu. When time came to move on, our cupcake tour guide informed us that our next stop wouldn’t be to a cupcake shop. A bit of a bummer since the whole point of this tour was to try as many cupcakes as possible. 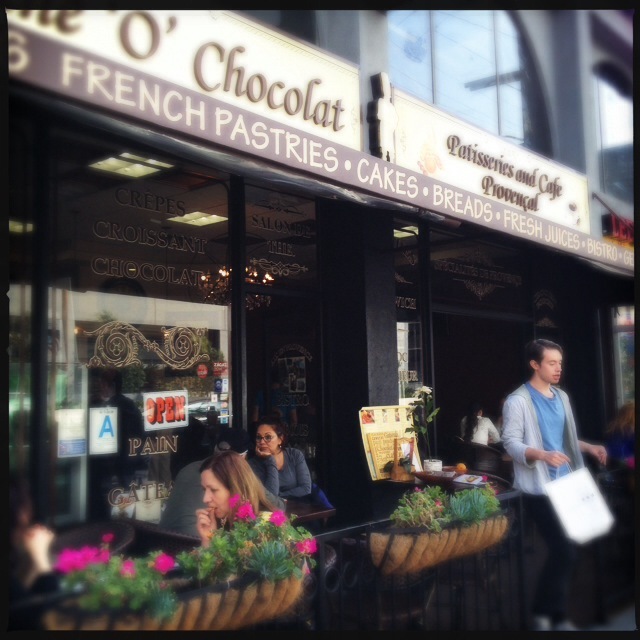 Instead, it would be to Tartine O Chocolat, a French style pasty cafe, where we would be given the chance to taste one of their French macaroons. 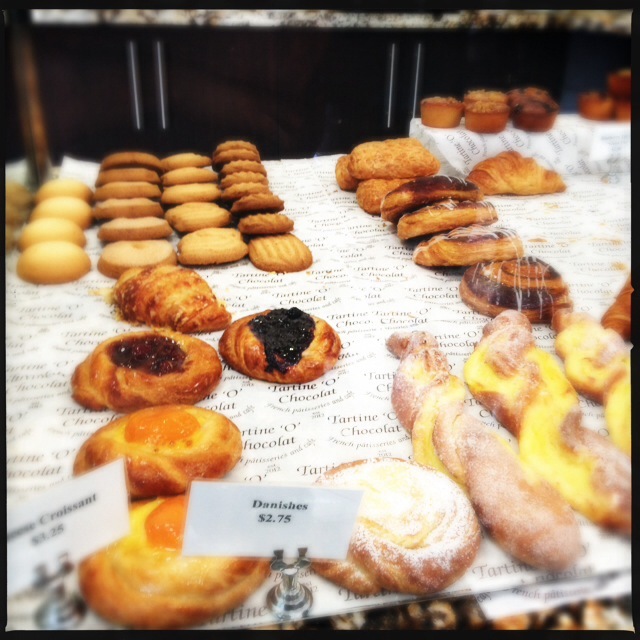 To be fair, the pastries looked great but Chris doesn’t like macaroons. So, that was one less tasting that he would be enjoying for the price we paid. I’m not an enormous fan of macaroons either but I figured that I had paid for it, so I would try it. 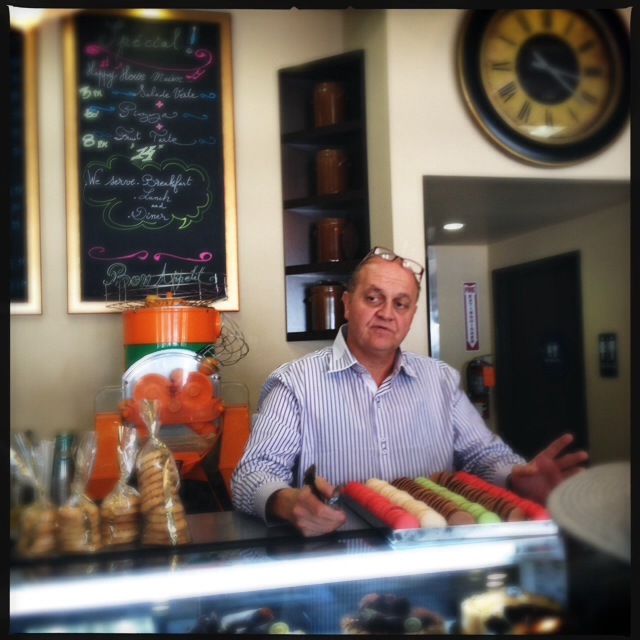 The man that ran the cafe was kind and gave us some interesting history of the shop before he allowed us to select from a choice of flavors of French macaroons. Fairly predictably, I went for the chocolate macaroon and it was pretty good but it wasn’t a cupcake. You could be the best macaroon ever and I would still think you aren’t as good as a decent cupcake. 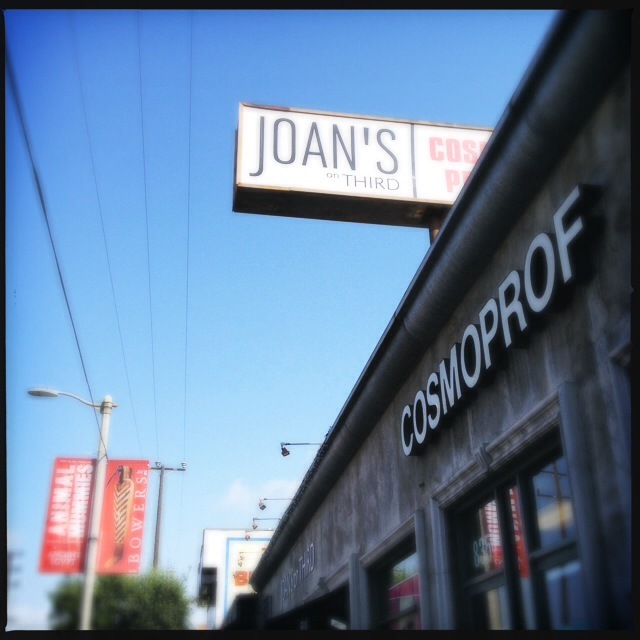 Next, we moved on to Joan’s on Third. Joan’s has been on my foodie radar since I moved to Los Angeles but I hadn’t been there before the day of the Hollywood cupcake tour. Sadly, I still feel as if I haven’t been there because rather than be invited inside to experience the feeling of Joan’s on Third, the guide left us part of the way down the block and asked us to wait while he went inside to collect the cupcakes we would be trying. When he came back, he had boxes of full sized chocolate cupcakes with him. To say that they weren’t good would be unfair to Joan’s. The cake itself was very rich and dense. I felt like I should be using a fork rather than biting into it. They were very good but they were more like a cake in the shape of a cupcake than a cupcake. Still, they were good enough to make me want to go back to Joan’s on Third and actually go inside. 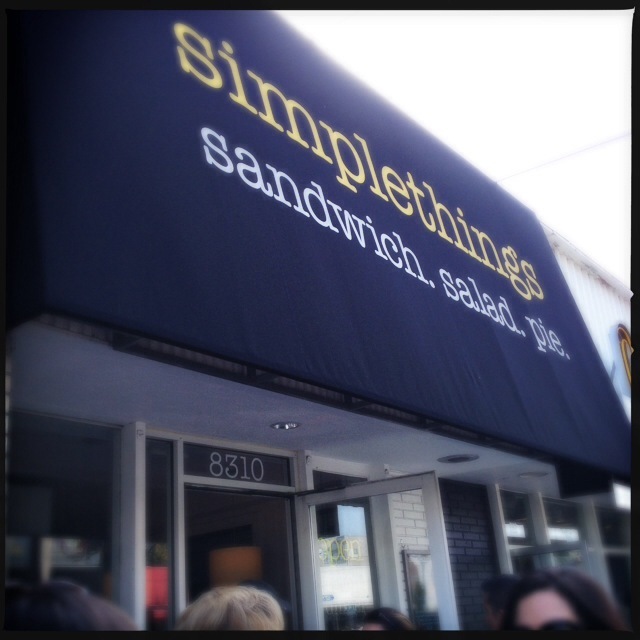 Next up was another non-cupcake stop in the form of Simplethings Sandwich Pie Shop. Initially, it was disappointing to have another cupcake taken out of the tasting count of what is advertised as a cupcake tour. However, in this case I am going to be forgiving because both myself and Chris thought their offering was the best thing we tasted on the tour. Amongst the pies that Simplethings offers are a series of mini pies they call Cutie Pies. On our tour stop, they gave us their salted caramel pie to try. I’m a sucker for salted caramel as a flavor profile. So, I was happy to taste the salted caramel cutie pie. I wasn’t so sure if Chris would find it appetizing but I loved that he was willing to go out of his comfort zone and give it a go. I know he is glad that he did because it was a true doughgasm moment. When we saw the salted caramel pie we were both concerned that it would be an overly sweet dish but instead we found it to be deliciously balanced. 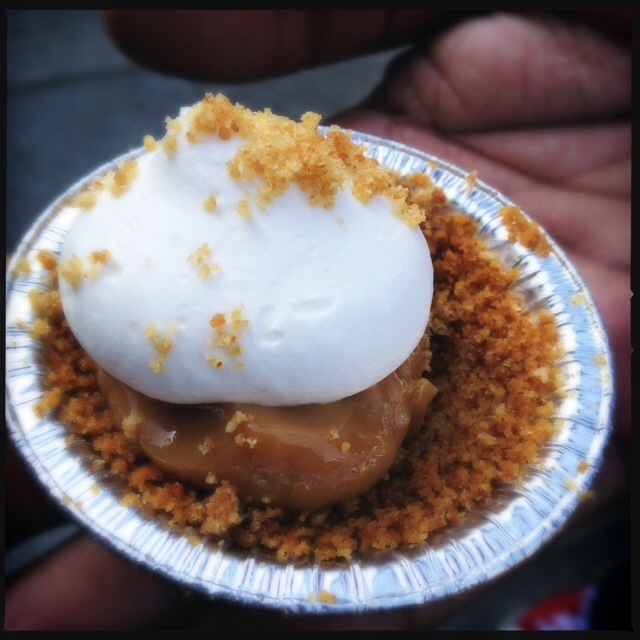 The graham cracker crust took on most of the work of bringing the sweet tones to the almost clean tasting salted caramel. The richness of which was cut by the unsweetened cream on top. Winner! As soon as my healthy eating challenge is done, I am dragging Chris back to Simplethings for more pie. Eventually the tour had to move on and the group headed to Sweet E’s Bake Shop. Happily, this took us back to being given cupcakes to taste on the cupcake tour. Sweet E’s is a super cute shop. The perky colors and playfulness of the shop design brought out the kid in in a candy shop feeling in our cupcake loving adult bodies. The cupcakes weren’t half bad either. 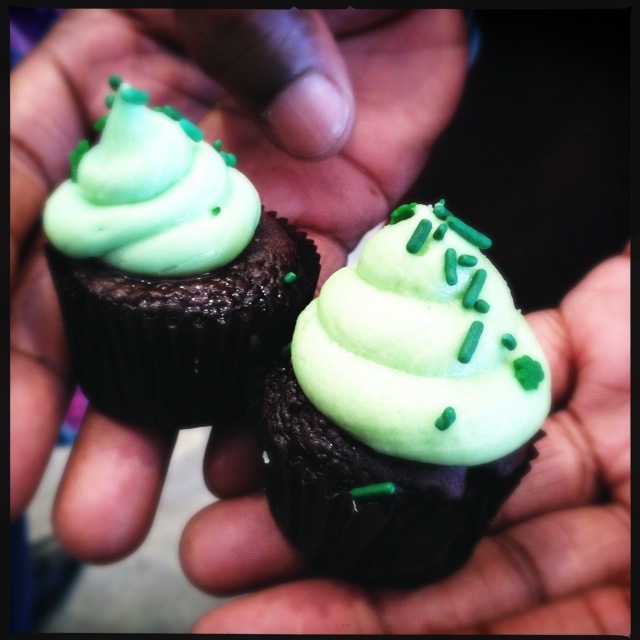 The cupcake that they offered the tour was the mini version of what they were calling an Irish Car Bomb cupcake. I feel that I would be untrue to myself if I didn’t address my dislike of the American insistence on using that name to refer to the popular beer,Baileys and whiskey cocktail. Having lived in the UK during some horrific car bomb terrorist attacks associated with the Irish troubles, I find the name to be in incredibly bad taste. Not just towards the victims of such attacks but to the Irish themselves where it borders on having racist undertones. There, now I said it. Anyway, no matter what they were called, the cupcakes from Sweet E’s were really tasty. The whiskey and stout that were involved added an adult flavors to what looked like a very youthful cupcake. We enjoyed them enough that after the tour was over, we went back and tried a couple more of the mini cupcake flavors available from Sweet E’s. They were all good but none of them popped as much for me as these. Allow me a girlfriend moment and say that I really love this photo of Chris holding the cupcakes from Sweet E’s. How lucky did I get to find a guy that not only enjoys foodie stuff but who volunteers to hold the things we try so that I can take photos for my food blog? He’s mine ladies! lol. 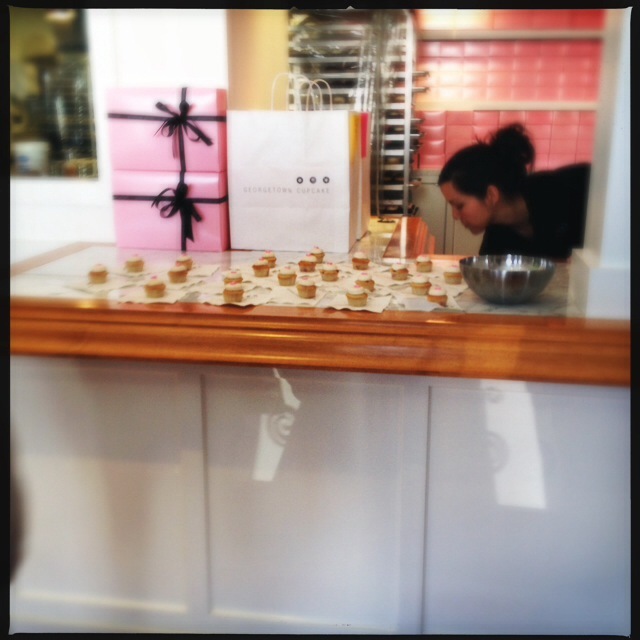 The final stop on the cupcake tour of Hollywood was Magnolia Bakery’s Los Angeles location. I had been to their main New York City location a couple years ago and enjoyed what I had ordered so I was curious to see how the West Coast venue measured up. Aesthetically, they managed to keep the same quaint but modern feel to the shop which makes for a cozy and inviting atmosphere. The big displays of full sized cakes were a nice touch and good advertising for what they do beyond the cupcake menu. 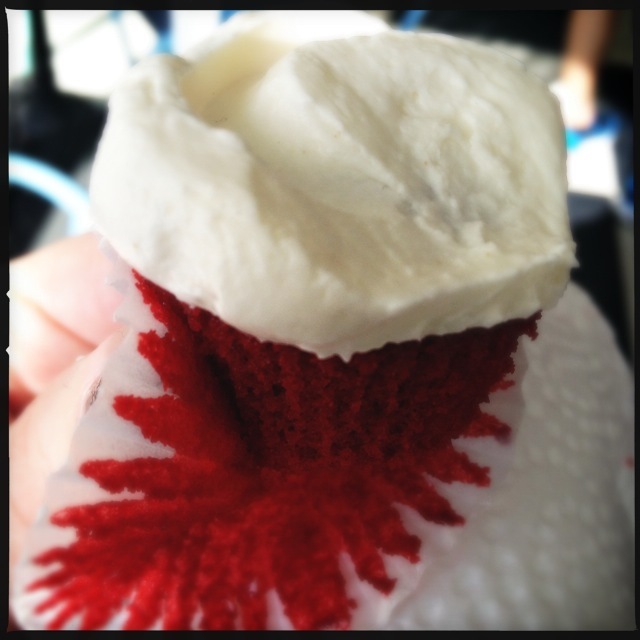 At first, I groaned a bit when I heard that what we were being offered from the Magnolia Bakery was a mini cupcake version of their red velvet cupcake. There we were again with the cream cheese frosting issue. Something which has meant that neither myself or Chris are big fans of red velvet cake. It all comes down to that dang cream cheese frosting. My sister and myself have been insisting to people for years that the red velvet cake that we grew up with in the Philadelphia area did not have a cream cheese frosting. It wasn’t exactly a buttercream either. Frustratingly, neither of us can remember the recipe for the family’s red velvet cake frosting despite having made it several times as kids. Sometimes on its own just so we could eat it with a spoon. Yeah, I was pretty much destine to be the fat kid. Preparing myself for disappointment, I bit into my mini red velvet cupcake only to be met with a yummy frosting that was not cream cheese! This was the nearest I had been to that family frosting in the years since I moved back to the United States. Reading the Magnolia Bakery’s menu, they use a whipped vanilla frosting. Bingo! With them being a New York operation, perhaps it was a case that red velvet didn’t always have a cream cheese frosting in the North East but that the Southern recipe that included it has since become the national norm? Whatever the reason, It was great to have validation of what I had spent years insisting to be the case. Once the tour was over, we were left wondering between us if it had been worth it. We did have a good time but largely because of being with each other. Was it worth the money? The truth is in the numbers themselves. After the tour, I went through the websites of the places we stopped at on the tour and did some calculations. We could have gone to each shop and bought the items we were served for a total of $16 per person or $32 for the pair. At the full company price of $100 for two people that is a ridiculous mark up. As it was, we paid $47 for the tour through Groupon so the level of service from the tour guide could have swung things. Unfortunately, we were both really disappointed in the tour guide. At each stop, he would take a moment to give us some background on each of the shops. Seriously, just about every time the story boiled down to how they were originally from Europe and then came to the States and started baking and were now running successful businesses. Not much at all about the actual food was shared. He was also pretty rubbish at keeping track of his group. The tour covered a lot of ground between shops which meant a bunch of crossing streets. Not once did the tour guide wait at the other side to make sure everybody had crossed before he marched on. Instead, there were always a few people left way back trying to keep a visual on the group so they could eventually catch up. This lack of attention to his group was made most evident when several people left half way through the tour without him noticing. All of which was made just a bit more tacky when he ended the tour by making a plea for tips. Normally, I would tip a guide but for $16 worth of tastings, I felt like I had already tipped the company enough. Not least because two of the promised tastings on the cupcake tour weren’t even cupcakes. Whilst I enjoyed eating cupcakes with my sweetie, the truth is that for $50 we could have put together our own self-guided tour based on Yelp reviews and been able to sample a lot more than we did on the official tour. In fact, I might just have to put together my own Doughgasm tour of Hollywood for us to do on our own. That way I can go back and try more from the cupcake shops that we enjoyed without feeling I am paying for more than is being delivered. This entry was posted in Eating Out In Los Angeles, Foodie and tagged Cupcakes, Food Groupons, Hollywood. Bookmark the permalink. You are welcome. 🙂 I’ve thought about putting together Doughgasm’s Guide to LA Cupcakes. It may yet happen. Very nice review, but I already bought the tour…. I hope we, at least, get a proper and responsible tour director. The cupcakes will taste good and that’s the main point. I hope you do end up enjoying it.